I found this plant in a garden on a street. Please can I have the name of it? Will it grow in the shade and is it an annual or perennial? 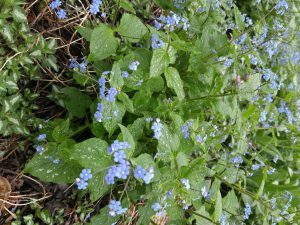 The plant you found is a variety of Brunnera macrophylla, commonly called Brunnera or Siberian Bugloss. From the slight variation on the leaves it would seem to be Brunnera macrophylla “Langtrees”. Brunnera is a clump forming perennial. It grows in average well-drained soil in part shade. While it will grown in sun, in such conditions the leaves may scorch. Plants may self seed, in optimal conditions. This plant is a lovely addition to a shady or part shady garden. Good find!